Raising up men has never been easy, but today is seems particularly tough. The young and old need heroes to embody the eternal qualities of manhood: honor, duty, valor, and integrity. 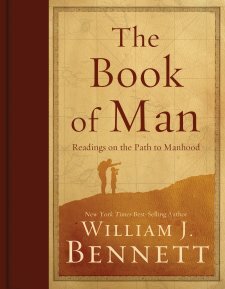 In The Book of Man, William J. Bennett points the way, offering a positive, encouraging, uplifting, realizable idea of manhood, redolent of history and human nature, and practical for contemporary life. Using profiles, stories, letters, poems, essays, historical vignettes, and myths to bring his subject to life, The Book of Man defines what a man should be, how he should live, and to what he should aspire in several key areas of life: war, work, leisure, and more. "Whether we take up the sword, the plow, the ball, the gavel, our children, or our Bibles," says Bennett, "we must always do it like the men we are called to be." The Book of Man shows how. This is a neat book. Not one to be read in one sitting, but to be read over several weeks, as it comes in at a whopping 576 pages. The book is split into sections such as Men and Work, Men in Politics, Men and War, etc. Each section has several profiles of men in that category and writings to do with that topic. Not every story and poem was riveting and interesting to me, but this is still a great book and worth reading. The stories about men who have done great things in war and on 911 for our country alone make this book worth reading. Its obvious Bennett put a lot of time, research, and effort into this book. The idea is given in reading about the book, that it is to help men grow up to be real men, but young men might get bogged down some by parts of the book, although there are other parts that would be more relevant. Overall, I'd recommend this book for men in any stage of life. There is something in it for everyone. Something that will inspire and make us want to be and do better. Dr. William J. Bennett is one of America’s most influential, and respected voices on cultural, political, and educational issues. Bill Bennett studied philosophy at Williams College (B.A.) and the University of Texas (Ph.D.) and earned a law degree from Harvard. Host of the top-ten nationally syndicated radio show Bill Bennett’s Morning in America, he is also the Washington Fellow of the Claremont Institute. Former chairman of the National Endowment for the Humanities (1981-1985), and Secretary of Education (1985-1988), and first director of the Office of National Drug Control Policy (1989-1990), Bennett is a regular contributor to CNN and has contributed to America’s leading newspapers, magazines, and television shows. He is the author and editor of seventeen books, two of which—The Book of Virtues and The Children’s Book of Virtues—rank among the most successful of the past decade. He, his wife Elayne, and their two sons, John and Joseph, live in Maryland. The Book of Man is available from Thomas Nelson. Thanks to Booksneeze for the review copy.